March Madness, it might mean NCAA basketball to you - Sweet Sixteen, Final Four, and all that - but around here it means cleaning out the freezer. Every year a mental lightbulb clicks on in March, a reminder to inventory the freezer and plan meals around whatever turns up. This year was even more challenging than usual. I admit to being an enthusiastic grocery shopper, always tempted by bargains in the meat department. And as a result the freezer held far too many frozen treasures. Could we eat our way through all of this before moving aboard the boat in mid-April? The four freezer shelves were marvels of neatly wrapped/labeled/dated packages, each shelf well organized by content. Fruits and vegetables on the top shelf; butter, bread, tortillas and puff pastry, etc. on the second shelf and so on. Surveying the bottom shelf I found steaks, chicken pieces, ground lamb, pork chops, pork tenderloin, pork shoulder, bacon, ground pork, chorizo sausage… hey, what’s with all of that pork? Near the end of the month the task looked promising, with fewer packages and a lot of empty space… except for some pork, still lurking there, on that bottom shelf. Chili Verde to the rescue. It’s good as a stand-alone meal, terrific as a taco or enchilada filling, and has filled an omelet or two. Any leftovers could be frozen and travel to the boat with us, arrival dinner or something. I'll share the base recipe, but confess I frequently adjust it. I should also 'fess up to a total lack of photos. I sliced, chopped, sauteed, stirred and simmered without a single picture. We ate it once, twice and then again without one shot. Maybe next time. 1. Roast tomatillos and chiles on baking sheet, 4 inches below broiler, until dark – about 5 minutes. Roast on other side. Cool, remove seeds & stems, then transfer everything to a blender, including all juices. Process until smoothly pureed. 2. Heat oil in heavy, medium-sized Dutch oven. Brown pork well (about 5 minutes per side) on 2 sides. Remove pork. 3. Reheat the Dutch oven over medium heat, pouring off all but 2 tablespoons of drippings. Cook onion, stirring regularly, until golden. Add garlic and cook a minute longer. Stir in the spices and cook until fragrant. Raise heat to medium-high, and when oil is really sizzling, add tomatillo puree all at once. Stir until noticeably darker and very thick. Add 2 cups broth and the fresh cilantro. Taste and season with salt, usually 1 tsp. Stir everything thoroughly. 4. Snuggle the browned pork into the warm sauce, cover pot and simmer over very low heat. Cook for 30 minutes. Salt and pepper to taste. Taste again and add peppers (or green salsa) for desired heat level. Cook uncovered for another 30 minutes, stirring occasionally and adding more broth as needed. 5. Serve with white beans or rice, topped with cheese, etc. Note: the sauce alone is also terrific with burgers, chicken and fish or as a topping for enchiladas. I don’t bake many sweets... don’t eat many sweets... don’t even think about sweets very often. Yesterday was an exception since I had invited a girlfriend, Pat, for coffee. Pat loves to bake and said she would bring along a treat for us to nibble on. Yum, that sounded good, but you can’t invite someone over and then not feed them, Mom taught me better than that. So I skimmed my computer recipe file for inspiration... nope, not feeling inspired. 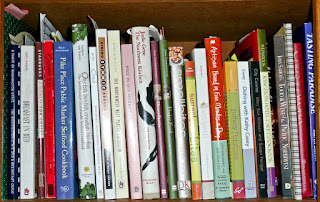 I flipped through several B&B cookbooks for inspiration... nope, still not inspired. 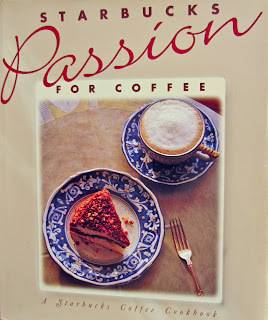 Then a slim, rarely used volume, smooshed way left on a cookbook shelf, caught my eye… Starbucks Passion for Coffee . This one might work. The cover photo featured a coffee cake that looked pretty tasty, and I had all most of the ingredients on hand. 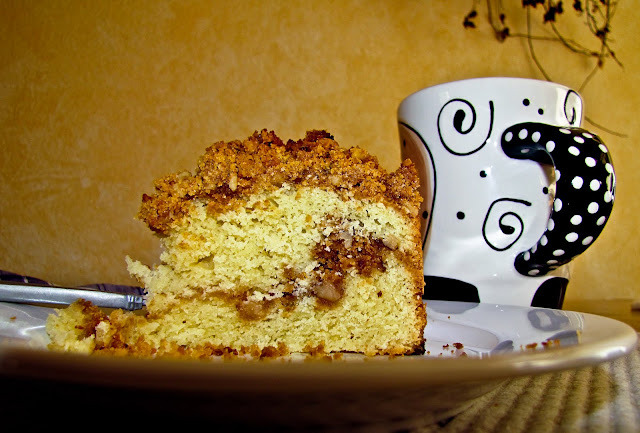 Streusel Crumb Coffee Cake was a good choice, not too sweet but sweet enough. Pat’s Craizin Bread was terrific, especially toasted and spread with a bit of lingonberry jam, but I like to think the coffee cake held it’s own. We ate ladylike slices of coffee cake yesterday, but today it's half gone... not all my doing, Ron enjoyed it too. To make the streusel: combine the graham cracker crumbs, walnuts, brown sugar, spices and melted butter. Blend well and set aside. To make the cake: sift the flour, sugar, baking powder and salt into a large bowl. Add the butter, eggs, vanilla and milk. Beat vigorously until smooth and quite thick, about 1 minute. Spread half of the batter in the prepared pan and sprinkle with half of the streusel mixture. Spoon the remaining batter over the streusel, then top with the remaining streusel. Bake until a long wood toothpick inserted in the center of the cake comes out clean, about 50 minutes. (Nope, in a 9-inch springform pan it took an extra 20 minutes of baking at 350 F) Cool about 20 minutes, then remove the cake from the pan. The cake took an extra 20 minutes in the oven to firm up; oh! did that batter jiggle after the recommended 50 minutes. After the extra time the streusel was just threatening to scorch. Burnt streusel is not very appetizing, so I carefully flicked off the few dark crumbs - shhhh, don't tell. After cooling for 20 minutes, the center/bottom 1/8 inch of the cake was still quite moist - we ate it and enjoyed it anyway. After a couple of hours most of the extra moisture seemed to disappear. Next time I will use a tube pan and see if it bakes more evenly when the heat can more readily reach the center. Wow, the opening text on the Sardine Avocado Sandwich entry is HUGE - I must have done something very interesting to that post. Now it won't load in Edit/Compose mode for me to shrink it back to normal, so sit way back away from your screen when you view that one. Do you suppose I was affected by nibbling on too many of those strange-but-good delicacies? Later note: abovementioned problem now corrected - thank you BLOGGER. Avocado and Sardines - really?! Avocado and sardine sandwich? Ugh, doesn't that sound totally unappealing, like some type of diabolic dietary punishment? But that item has been all over the internet lately, in blogs and on YouTube, and I just couldn't resist trying it, at least once. The two ingredients are so distinctive in texture, so different in taste - who came up with this combo? Answer: Alton Brown, the Good Eats guru on TV's FoodNetwork. The original recipe called for flat leaf parsley. I didn’t have any fresh parsley on hand so I substituted fennel fronds. Italian parsley has a bite, fennel fronds have a hint of licorice. They are quite different, but it worked. The sandwich benefitted from the added sparkle of lemon zest and lemon juice and was actually quite tasty. On my second try I made it tuna-salad style, smooshing together the sardines, oil, lemon zest and juice with minced parsley and chopped green salad onions. It tasted pretty much the same as the first batch. Next I made a guacamole-style spread with the avocado, some drained oil, parsley, lemon zest and juice to spread on the bread slices. I topped this with sardine slices. This was my least favorite version - the feeling of those tiny bones and bristles hitting my mouth first was not a positive experience. No, I wouldn't eat it every day (or even every week) but I will prepare it and enjoy it again. That said, you won't find it at my house served to the Ladies Who Lunch... not ever... not even if they are culinary adventurers. 1. Drain the oil from the sardines into a small bowl and add the parsley, lemon juice and zest, and black pepper. Stir to blend. 2. Add the sardines and stir but don’t smoosh. Let sit for a bit to flavor the fish. 3. Toast the bread in a toaster or on a grill. 4. Drain the sardines, saving the liquid. Now it’s time to smoosh these guys (gently) on top of the two bread slices. Arrange the avocado slices on top of the fish. 5. Pour any remaining sardine oil dressing on top. Season with sea salt (optional).